I know these things are on the RAGE right now. Who can deny the fact that those little minions are cute! No wonder everyone is making cupcakes, cakes, hats, costumes, etc. in honor of these adorable little creatures! 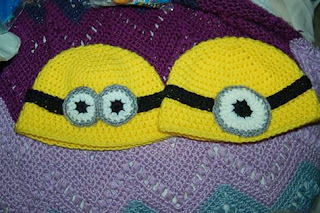 My friend asked me to make minion beanies for her- her husband is going to dress up as Gru, and any little kids that want to join in the costume just need to dress up as a minion! Cute idea, right? Here is what I came up with (photo taken before I added hair). Hopefully I'll get a photo of them on the cute models I made them for!